Beyond Dipkarpaz, to reach the northern coastline, you must turn left uphill from the centre of town, passing the long white school building on your left near the brow of the hill, and follow the arrows to Ayios Philon. Soon you'll join the tarmac road to begin the long descent to the coast, 4km away. As you make the descent you can already see in the distance the church of Ayios Philon, standing alone on the shoreline. 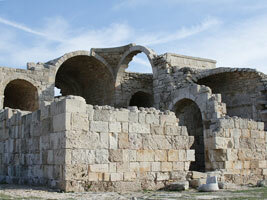 This was the site of the ancient city of Karpasia, founded by the legendary King Pygmalion of Cyprus. It was a flourishing Christian community until the Arab raiders burnt and sacked it in 802. Its inhabitants fled inland at that time and Rizokarpaso grew up. Today Ayios Philon is the spectacular location for Oasis at Ayfilon, the sustainable eco-tourism venture spearheaded by Michael de Glanville, offering simple fresh food and several rooms by the beach. The spot is beautifully remote, with only the sound of the sea against the rocks and the twittering of the birds. The church is set on the cliffs above a rocky bay with six solitary palm trees breaking the skyline. Traces of the old harbour wall can still be seen where you swim, the large stone blocks still extending some 100m, while the remainder of the town lies hidden under the sand dunes away to the west. Philon was the name of the 5th-century bishop who converted the inhabitants of the Karpas to Christianity. The well-preserved church complete with roof is 10th century, but beside it, open to the elements, the red, white and grey mosaic pavement and column remnants belong to a 5th-century basilica, the original church of Bishop Philon. Nearby are a few heavily vandalised Greek houses of this century.